Ashni Patel and Hannah Miller signed up for the Bulldogs Into the Streets volunteer program as a way to meet new people and help the community. As a bonus, they’ll end up on local TV news. The two were among five Butler freshmen who’ll be featured on WXIN (Channel 59) in a future segment about volunteerism and what it means to be a Hoosier. The Indianapolis Fox station watched them work at Gleaners Food Bank, where they packed boxes of food to be given to needy families. Patel – who is a Hoosier; she’s from Westfield – and Miller, who’s from Winfield, Ill., said the TV experience was fun. But volunteering was the truly rewarding part. In all, 550 Butler students fanned out across Indianapolis on Tuesday as part of Bulldogs Into the Streets (BITS), Butler’s annual day of volunteer service, which began in 1995. They worked at 23 locations, watering trees, caring for adoptable dogs, cooking for the homeless and more. More than 100 students – and about 45 members of Butler’s Advancement team – spent several hours at Gleaners Food Bank, which provides provisions for needy people in 21 central Indiana counties. 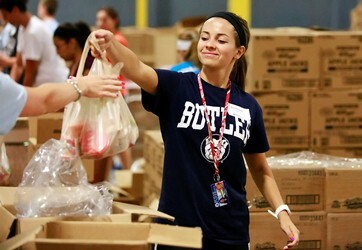 Gleaners estimated that the Butler volunteers turned in the equivalent of $70,000 worth of work. Butler requires all students to participate in community service as part of the University’s Indianapolis Community Requirement. BITS is another way Butler gives back. Ambassadors of Change is yet another. Last week, around 90 Butler students in that program devoted several hours each day on projects related to hunger, disabilities, sustainable food and affordable housing. On Friday, Aug. 17, they visited St. Paul Street on Indianapolis’ Southside to pull weeds, pick up trash and do yard work in conjunction with the Fuller Center, which plans to build two new houses there. Then she kept coming back. “I want to give the incoming students the same wonderful experience I had,” she said. Ron Fisher, a board member with the Fuller Center who was supervising the student workers, said the Butler students were helping the effort to revitalize a neighborhood that had been ravaged by drug dealers and prostitutes. Now there are 10 new houses – built by Amish volunteers from Shipshewana, Ind., Allison Transmission Inc. and Habitat for Humanity. But residents need some help with upkeep on their yards. That’s what Matt Brooks, a freshman from LaGrange, Ind., was doing. He was in the back yard of a handicapped resident of St. Paul Street, using a hedge trimmer to saw through some thick, overgrown weeds.